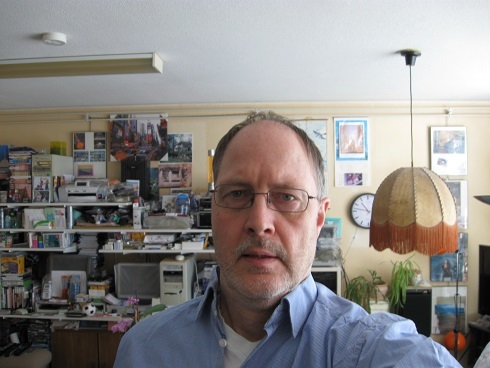 I was asked by my old friend who still owned an older model HP 6500 printer to look at his printer’s power adapter. This was a 32V 1560mA DC adapter (HP 0957-2271). With the primary specification 100-240V AC 1300mA. After removing the 3 small torx bottom screws it was easily opened. Which is a relief considering that most manufacturers still glue the plastic case sides together. A big glass 4A Fast fuse was open and the used mosfet type Infineon was definitely shorted. And probably the controller of type SG6842 8-sop was defect too. 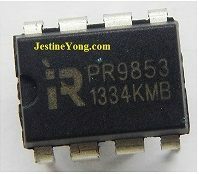 And a R48 smd resistor with value of 2R4 Ohm. Sadly that controller was not available through the normal Aliexpress and eBay online sellers. And if that is the case I stop looking further because other ways of buying likely turn out way too expensive. The controller Vdd input at pin 7 measured about 13VDC when I had removed the defect mosfet and bridged over the primary 4A Fast fuse with a light bulb. 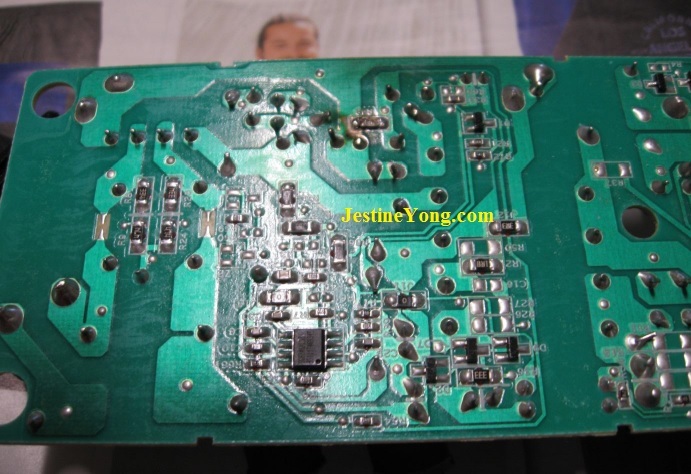 (measured between ground 120uF 400V e-cap/GND Diode bridge and input voltage pin7 Vdd). 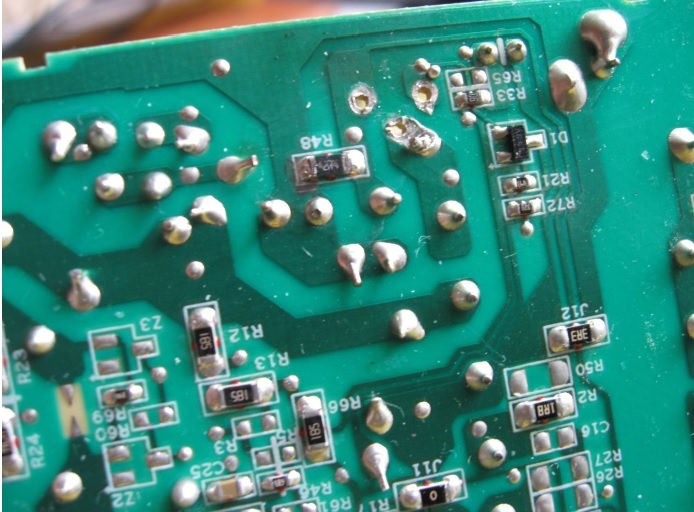 Above photo shows the defect SG6842 controller chip (IC1) and on the right the burned open 2R4 smd resistor (R48). After the mosfet short circuited it obviously took the resistor and the 4A fuse with him too. Next photo shows the solder side of the adapter board. Followed by a snapshot of the component side. Followed by two photos of the solderside with the mosfet removed on the second photo with now open R48 2R4 resistor on its left. 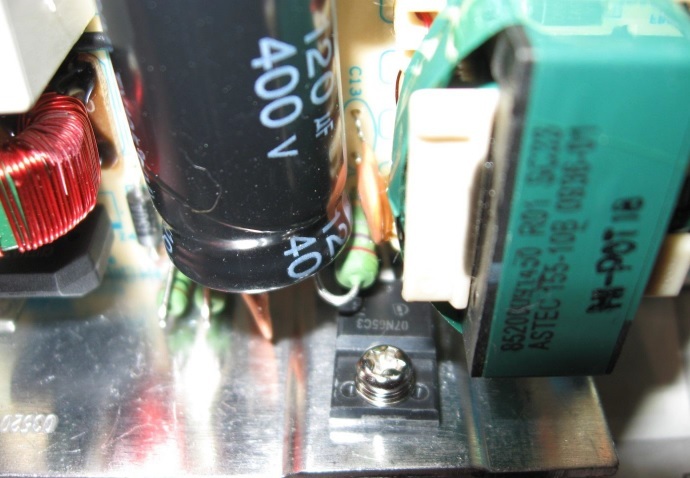 Next photo shows the defect 07N65C3 7.3A 650V mosfet with on the left the 120uF 400V e-cap and the transformer on the right. Because these HP6500 printers are becoming quite old now and many people dispose of them in favor of a newer (cheaper ink) model printer, the used adapters are easily found on eBay or other sites. And my friend therefore told me lateron not to bother to try to fix this old adapter anymore. But I nevertheless wanted to check if maybe the controller chip was still intact. After I replaced both the 2R4 resistor by an 2.2 ohm resistor and the mosfet by a type 11N60C enhanced N channel, I switched on the Power. But the green led on the secundary adapter side still didn’t work. So it was safe to assume that the controller chip was gone too. And that is why it is always best to replace both controller and mosfet on the primary transformer side both by new components! I checked the new 11N60C mosfet on my semiconductor testers. And made a photo of them simultaneously testing together two of these new 11N60C mosfets. 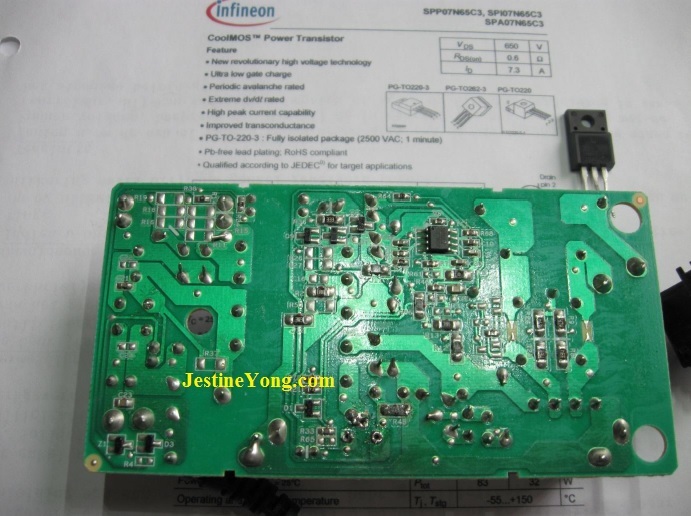 It was the same type of mosfet as the defect original 07N65C3 Infineon mosfet. 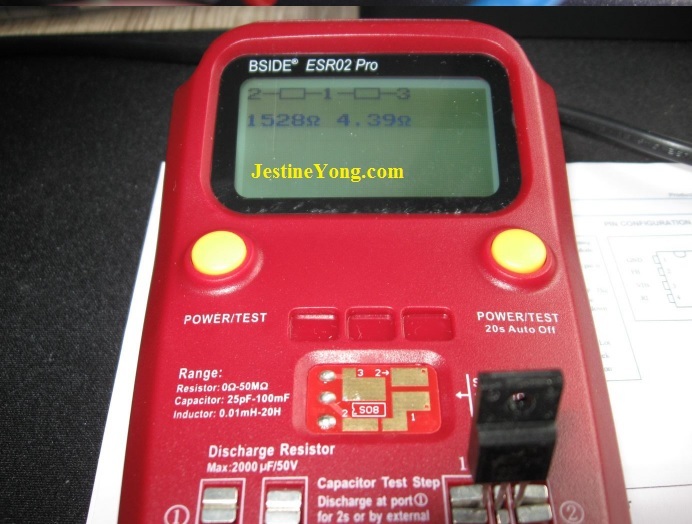 Funny thing is that my new cheaper BSIDE ESR02 Pro meter (mark the special blue coloured symbol in its color display!) almost worked identical to my much more expensive Atlas DCA Pro DCA75 semiconductor tester. 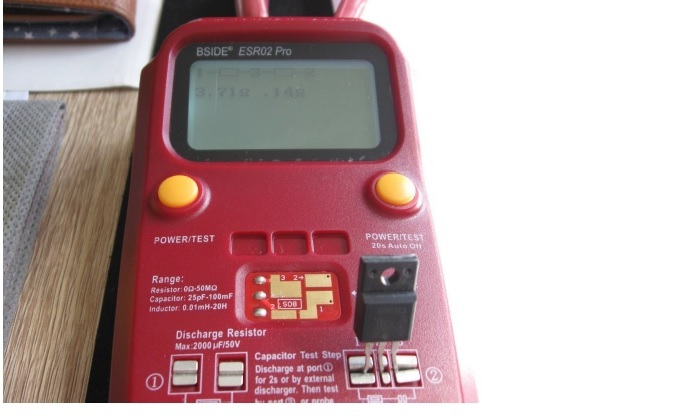 It only did cost 22.50 Euro and is also able to test capacity and ESR capacitor values, plus inductance of coils, and of course resistor values. And has a convenient smd copper test board panel on top. (also ideal for testing SO8 laptop type mosfets). Plus an external 9-12V DC power adapter connector, and component insertion test clamps, with 3 test lead input connectors. 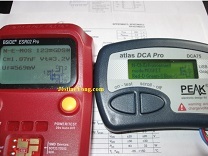 Whereas the atlas Pro DCA75 has the unique ability to show transistor curves on any PC. Thanks to the software on the included USB stick which makes it possible for instance to easily find matching transistor pairs. And afterwards make a print dump of the given data if needed. On previous photo the new 11N60 replacement mosfet (now also defect) which I tested after I removed it from the still not working power adapter. 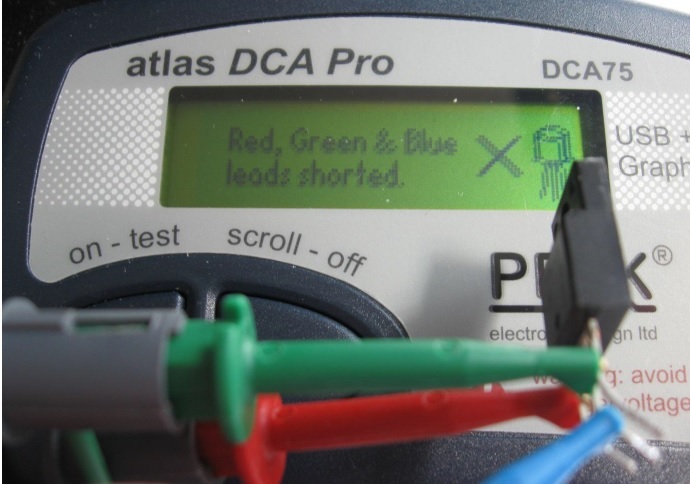 Previous photos showed that the atlas DCA Pro instead of the BSIDE ESR02 Pro just displays leads shorted for all leads. And the BSIDE still does show the exact measured mosfet resistance being 3.71 Ohm and 0.14 Ohm. If you try to test the adapter with a brandnew mosfet without replacing the old defect controller first, you in a worse case scenario likely may end up with having another brandnew shorted mosfet afterwards too, like the last photo showed. It happened to me after I decided to try the adapter with a new 11N60 mosfet without a new controller. Normally I simply replace both of them but now I couldn’t. But it now may also just have been the discharging of the 400V e-cap while desoldering the mosfet pins which I simply forgot to discharge before starting removing the mosfet. 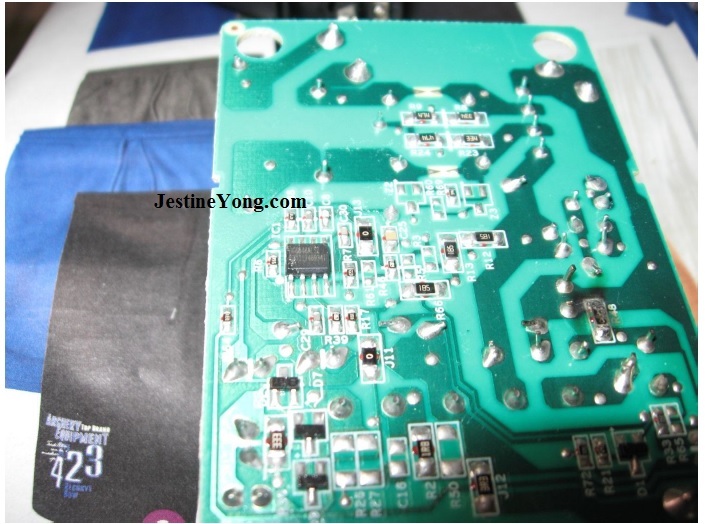 Anyway, only if you are able to find this SG6845 type of controller chip, you will be able to repair this little adapter because finding a new replacement mosfet is not that hard. Knowing this, you now likely may decide that it is no use to open this particular HP6500 printer adapter for repair. Experimenting with other pin compatible controllers, not being able to fix it without a new controller chip, is not my kind of thing and could easily lead to unknown failures or worse. Especially if you leave out a burn-in test or any other qualification test on your ‘modified’ adapter. I am sure that the original adapter circuit only works as the manufacturer had tested and approved upon with the original chosen components he used. (like manufacturer Apple who marks almost every semiconductor in its Apple service schematics as being ‘critical’. Indicating no other components qualify for replacements). But whatever you do, keep using fuses in your circuits to prevent the risk of fires! Anyhow, these defect adapters still do contain a few spare part components that may come in handy in future repairs. Like the 400V e-cap and the Greatz diode bridge on the primary adapter side. Very elaborate and detailed article with valuable information. 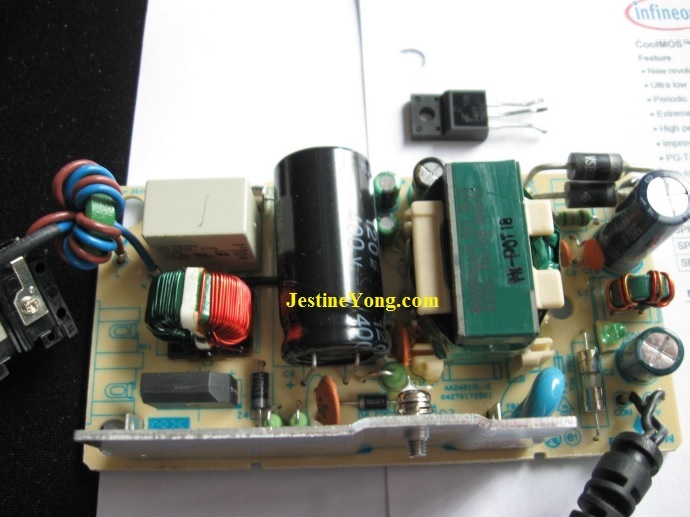 Good Power Supply Repair job.! And Very Nice teste meters. Thanks for the website tip Robert. I probably won't use it for the same reason as you had mentioned. Yeah, it's very expensive. You may be able to get a free 7 day tryout or something like that. It's an amazing site that many manufacturers use. 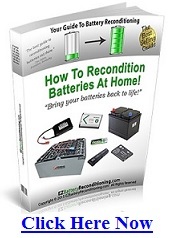 Glad to be able to share it on JY's great Blog on electronics repair Anthony! I have a question you change the 07n65c3 with 11N60c but if you see tha datasheet the schamatic is diferent because one have a zener between in gate and source and the 11c63 have a diode normal. you can say that are similar ? you can change the 07N65c3 to 11N63c thy are different?